Special thanks to Jen Jacobs Wahlquist for providing this photograph. Move cursor over photo for identification numbers -- Click on photo for larger version. 1. Clifford Pierpont, 2. Johanne (Anneke) Boot, 3. Stephen Alley, 4. Elizabeth (Bep) Boot, 5. Bruce Campbell, 6. Shirley Burton, 7. Jim Mitchell, 8. Latetia Peay, 9. Gary Rose, 10. Katie Zabriskie, and 11. Elizabeth Hancey. 12. Gene Hinckley, 13. Frances Bentley, 14. Robert Bunker, 15. Pat Boyce, 16. Kent Fairchild, 17. Adilia Dix, 18. Gordon Card, 19. Vee Ann Jeffs, 20. John Lambert, 21. Marion Orchard, 22. Paul Redd, and 23. Judy Prestwich. 24. Kenneth Bullock, 25. LaOne Beckwith, 26. Kent Crawford, 27. Ron Van Wagenen, 28. Gladys Saxton, 29. Richard Wilson, 30. Linda Tenney, 31. Lane Van Tassell, and 32. Tanja Larson. 33. Harold Morgan, 34. Carolyn Woodruff, 35. J. S. Wright, 36. Jeniveve (Jeni) Jacobs, 37. Robert Eastmond, 38. Nancy Oldroyd, 39. Morgan Richards, and 40. Faye Anderson. Special thanks to Tanja Larson Cannon for providing the name identifications for this photograph. 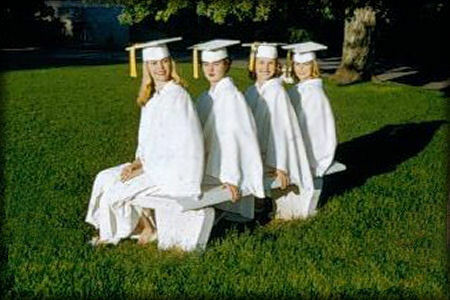 Our 50th year reunion was so much fun! We had about 44 people who came to Carolyn's house for a sit-down buffet dinner (catered by Blake Roni's private chef . . . he is the owner of NuSkin) and the food was delicious as well as beautiful. We sang the school song and took a group photograph, plus videotaped the entire evening and also took still photos (I invited married friends who came specifically to record the entire evening; he with the video camera and she with the Nikon). Max Gibbs flew down from Canada, so he came the longest distance. In addition, Paul Redd and Diane came from Colorado, and Bob Eastmond and Carolann came from Las Vegas. We only found Richard Wilson yesterday afternoon, and he said if he had received the invitation we sent, he would have flown over from Colorado (where he is developing 18,000 acres similar to his Bloomington, Utah development) in his private jet. 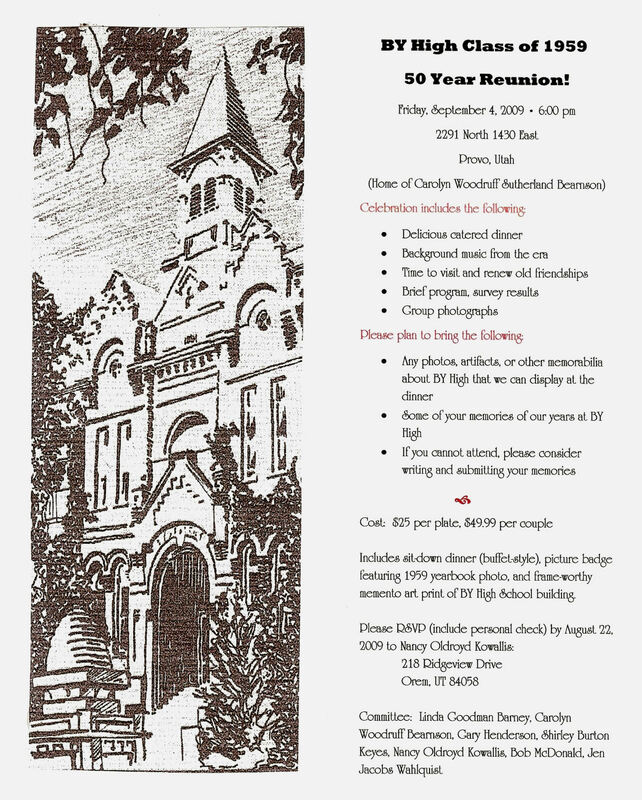 Carolyn Woodruff Bearnson purchased large art-prints of the BY High School building (the print Doug Smoot commissioned a few years ago -- the small version appeared on the postcard we sent as invitations, which she also provided) and gave one to each of the class members. In addition, she created a name tag for each class member who attended, showing that person's senior yearbook photograph and high-school names. She also opened her home to us for the evening, and did most of this just a couple of days after returning from a 35-day cruise with her husband. Nancy Oldroyd Kowallis handled all the finances and arranged for the catering. Bob McDonald created the survey and Gary Henderson collected the survey results; he also served as the Master of Ceremonies. Shirley Burton Keyes assembled the background music from the late 1950s. 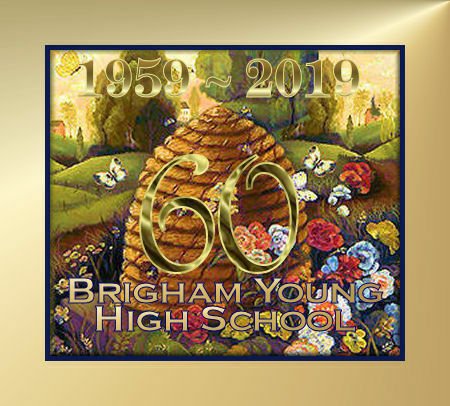 Steve Carter created CDs of the school song and made them available to class members; he has also created a Website which we can use to view our reunion video, which will be preferable to watching it on YouTube. Larry Christensen helped to publicize the event through the BYH Website, and sent email versions of the blank survey form. Linda Goodman Barney worked hard at tracking down names and addresses, and our complete roster of addresses is growing nearer to completion. We want to hold another reunion in five years because this one was so successful for those who attended. 1. Max Gibbs, 2. Gordon Card, 3. Harold Scott Morgan, 4. Bob Bunker, 5. Dave Shaw, 6. Steve Stumph, 7. Steve Carter, 8. Jen (Jeni) Jacobs Wahlquist, 9. Charlene (Gladys) Saxton Gillespie, 10. Nancy Oldroyd Kowallis, 11. Bob Eastmond, and 12. Gary Henderson. 13. Vee Ann Jeffs Mickelson, 14. Annette Hawker Spackman, 15. Shirley Burton Keyes, 16. Faye Anderson Frazier, 17. Paul Redd, 18. Lorraine Fullmer Day, 19. Lynda Goodman Barney, 20. Carolyn Woodruff Bearnson, 21. JoAnn Thomas Waddell. 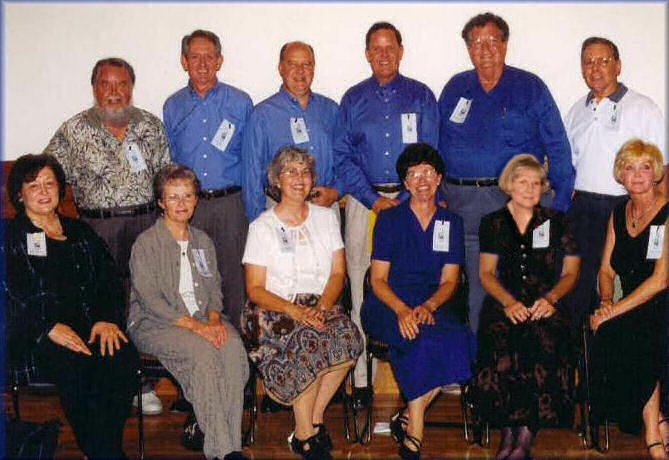 Teachers and their wives in the right background: James Mason, Wallace Allred, and Max Berryessa. Special thanks to Jen Jacobs Wahlquist for this photograph, and for the identifications. Move cursor over photo for identification numbers. 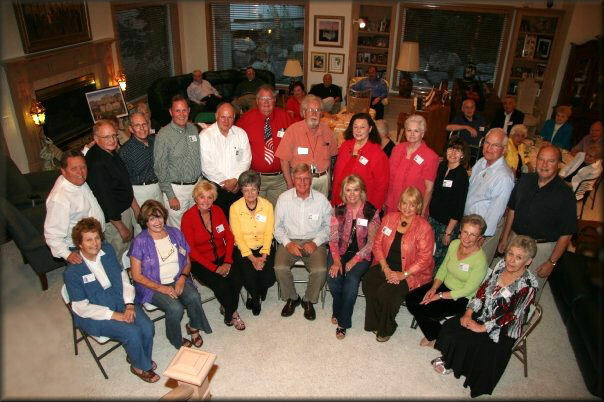 The Class of 1959 held a reunion in 2001 in Provo. 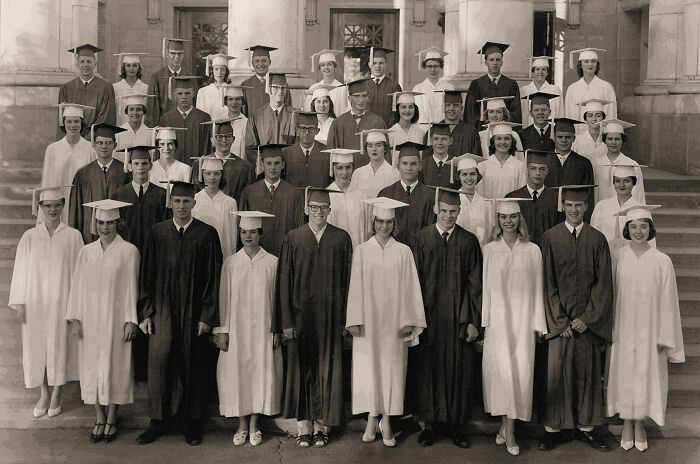 Move your cursor over photograph for identification numbers. 1. Jen (Jeni) Jacobs Wahlquist, 2. Carolyn Woodruff Sutherland Bearnson, 3. Vee Ann Jeffs Mickelson, 4. Nancy Oldroyd Kowallis, 5. Tanja Larson Cannon, 6. Shirley Burton Keyes, 7. John Carlyle Lambert, 8. Ron Van Wagenen, 9. Gary Henderson, 10. Bob Bunker, 11. Steve Stumph, 12. Harold Scott Morgan. Thanks to Carolann Eastmond and Vee Ann Jeffs Mickelson for identifications.